There is the barrel of a cannon, buried upright and projecting about 3 feet into the air in Roy Grove, Hampton. 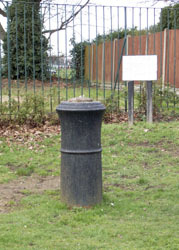 The cannon marks one end of the original base line used for the measurement by triangulation upon which all Ordnance Survey maps were subsequently based. The other end of the base line, five miles away is marked by a second cannon at a point on what used to be Hounslow Heath. This is now the Northern Perimeter Road, near where it passes over the tunnel entrance to Heathrow Airport. The method of measurementMeasurement of the distance between these points (originally identified by buried cartwheels) was undertaken in 1784, following experimentation with a variety of measuring rods. In effect this marked the real start of the 'Ordnance Survey'. The first objective was to determine, by triangulation, the relative positions of the Greenwich and Paris Observatories. Until the recent development of satellite positioning systems triangulation was the only feasible way of measuring distances across water. The method works by establishing a base line of known length, projecting two further lines at known angles to form a triangle, and calculating their respective lengths by trigonometry. It is imperative to have an accurately measured base line, which in this case was over 5 miles long. William Roy's measurements were in fact accurate to within three inches over the five miles and details are given on the memorial tablet beside the cannon. A line was established and marked by a cleared pathway running for the whole length of the chosen line. minor undulations in the virtually level ground were ironed out or filled and all vegetation removed from the track. The work, undertaken by a detachment of men of the 18th Foot, stationed at Windsor was completed between 26 May and early July. Major-General William Roy (1726-90), after whom Roy Grove is named, was a Royal Engineer and geodesist: a person who makes scientific study of the earth's shape and size. After Roy's death in 1790 his work was gradually extended outward from the south-east of England and by 1823 covered much of the country. In 1926 there were reports of the proposed enclosure of Charities land, “the site of General Roy's gun”, then hidden from public view by a clump of trees. A memorial tablet was planned to celebrate the 200th anniversary of his birth, on 4 May 1726. The Astronomer Royal, Sir Frank Dyson, unveiled the memorial, slightly later than planned, in February 1927. At the time the land, now occupied by present-day Roy Grove and the adjacent Cannon Close, was part of the Cannon Field. Twickenham Borough Council subsequently developed the roads as a housing estate in 1947. 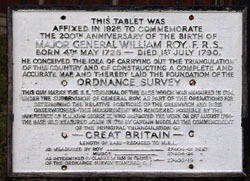 The cannon and nearby tablet remain in place to this day as a reminder of the important connection between Hampton and Ordnance Survey mapping. 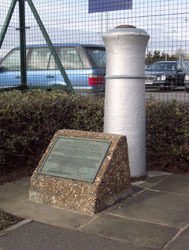 The cannon and nearby tablet remain in place to this day as a reminder of the important connection between Hampton and Ordnance Survey mapping.